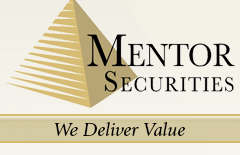 Mentor Securities is a preeminent middle market investment bank dedicated to providing the highest quality, step-by-step advice to help you maximize value and successfully complete a transaction. Unique to Team Mentor Securities is our diverse backgrounds. Our professionals have detailed valuation expertise (including extensive financial modeling); public accounting, private equity, and Wall Street work experience; and, served as business owners and operators, as well as executive management in many industries. The Mentor Securities team has extensive experience in sellside and buyside mergers and acquisition advisory, from the sale of private and family-owned businesses to corporate divestitures, as well as going private transactions. We also assist clients to raise debt and equity capital; structure recapitalizations; effect corporate restructuring and renewal; and advise boards on strategic alternatives and fairness opinions. Our representative clients include entrepreneurs, corporations, hedge funds and private equity groups. We also advise clients on acquiring and financing add-on acquisitions and to execute and finance buy-and-build/consolidation strategies. In addition, we have negotiated and structured a number of cross-border transactions, including sales, mergers, partnerships and joint ventures.